Indian Writing in English from India’s North-East has come a long way in the past several years. It is now recognized to be a category in itself, bringing a freshness and a vibrancy that’s almost a marker. Murli Melwani is definitely a writer who can be classified as being from India’s North-East, even though it has been decades since he has lived here. One of the earliest authors of this category, his life and writings have ranged far and wide. From Shillong, where he grew up, through many countries in the Eastern and Western hemispheres, Melwani and lived in and travelled through them all. All the while, he has observed, and created stories that reflect these milieus, refracted through the prism of his unique individuality. He has been writing for decades now, and has been published in prestigious journals worldwide. Ladders Against the Sky, published by Kaziranga Books, is a collection of 23 stories, the genre for which he’s best known, and in which he excels. With a Foreword by Victor Banerjee, these stories are people by individuals whose actions, as they propel the action forward, make for engrossing reading. Backgrounded against diverse locales, from India’s North-East to the country’s metros to Hong Kong, Bangkok, Taiwan, the U.S., Canada and many other places, these pacy stories with diverse themes make very engrossing reading. About half the stories in the collection centre around the Sindhis, a community of which the writer is a member. This is a community which today, after Partition, does not have a homeland. Sindhis now exist as a diaspora. Melwani’s stories, besides being excellent in their own right, are also important as a documentation of the lives of Sindhis. This includes the way arranged marriages are organized with families living in different countries and continents. They also give an insider’s view of this enterprising business community, the networks they have, often with humour. Since very little fiction has been written about this community in English, this book is also important in this regard. The narrative in these stories is backed by the author’s moral compass which sometimes follows people using unethical practices, in business and otherwise, to their inevitable doom. Others depict a clash between civilizations, played out in the domestic sphere. The Sindhis’ preoccupation with business is balanced with the depiction of the extraordinary levels of hard work they put in, as they move from almost rags to unimaginable riches. In a way, this mirrors the history of the displaced community as well. It is notable that the cover, beautifully designed with understanding and subtlety, by Aditi Phukan, has already won praise worldwide. Ladders against the Sky is a wonderful collection of short stories from a master story-teller, remarkable both for their interest as sociological documents and also as interesting explorations of character, with diverse themes. I picked up this book and started reading it as reference material for a research paper on the global Sindhi diaspora. The author is a global Sindhi businessman and I knew, in a patronising sort of way, that I was surely going to learn something interesting. Halfway through the fourth story, when I had to get something else done and it was a wrench to put the book down, I realised that I was in fact reading entranced. These were splendid stories: good plots, lifelike characters, beautifully laid out in clean, distinctive language. What made them even more fascinating was that each one is set in a different, exotic location. Murli Melwani is an inveterate traveller and this collection, as the jacket describes it, is a “gift of his travels”. 15 of the 23 stories are set in different parts of India and in them we encounter separatist movements, landslides, cramped urban spaces, insights into different aspects of religious devotion and various other complex situations in unexpected locales. Murli grew up in Shillong. Between school and college, he travelled a lot and visited different parts of India. Later he worked in the English Department at Sankerdev College, then took up a Coca Cola distributorship and for a while ran a bookstore. In time, he moved to work in Taiwan and his job took him to countries around the world, doing something many Sindhis do. A little more than half the book features this diaspora, families which originated in Sindh and now live and do business in countries around the world. “Water on a Hot Plate” is set in Toronto. Hari and Rajni are visiting their son there and in this story, they meet an Indian Chinese lady who runs a restaurant there. They converse with her in Mandarin – from their several years in Taiwan; of course they speak to her in Hindi and English too. From the Bollywood music playing in the background, Hari can tell that the India she belonged to was not the India he had left. Resh, their lunch guest, is visiting from Curacao. She speaks Dutch and English and even idiomatic Papiamentu – a Portuguese and Spanish-based Creole language – but not Sindhi. “Writing a Fairy Tale” is a gripping love story in which we somehow journey into the rainforests of eco-versatile Chile – and also, unexpectedly, encounter the Arabic aspects of the country too. “The Mexican Girlfriend” is also a love story, and though set in a home by a lake where migratory birds flock – a real place – also a subtle metaphor – has more sinister than exotic twists. Followed by “The Bhorwani Marriage,” a high-energy satire of Sindhi weddings, including an expose of the business opportunities offered by matchmaking in the diaspora, it appears that Sindhis don’t really do romance. Family comes overwhelmingly first; business and profits are a priority; living comfort is never going to be sacrificed for a lover. Saaz Aggarwal is the author “Sindh: Stories from a Vanished Homeland”,”Sindhworkis: A Unique Global Diaspora” and the forthcoming, ” The Amils.” She lives in Pune. 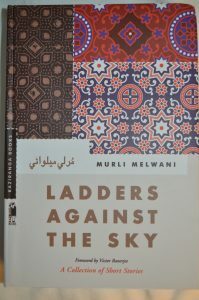 The title of Murli Melwani’s collection of short stories should have been “Against Many Skies.” More than half the stories crisscross India and her myriad cultures; the rest follow the ancestral trading trails beyond India’s borders trod by the hoary ancestors of a unique community, the Sindhis. I was so impressed by the perspectives the stories present that I could not help but make brief comparisons with the reality that exists today. “A Bar Girl.” The story touched me greatly. The life styles that both Amar Badlani and Rak have chosen prevent them from stopping and evaluating their lives or asking where there are heading. For me the significant event was the visit of Amar Badlani with Rak to her village; it brought home to him the fact that his estrangement from his family had its roots in his working life. His damage control efforts lead him to finance the nursing education of Rak and make overtures to his kids and grandkids. His efforts succeed. As a kid in Jakarta, I remember seeing and hearing about Sindhi men with local wives. People talked disparagingly about them. But then that’s life, you take the sour with the sweet and turn it into bhel. The young Jimmy Ramnani, In ”Writing a Fairy Tale,” had literary aspirations. But the attraction of money and the ties to family that made his comfortable life possibly distracted him from his dream. In Carmen, the wife of one his bigger buyers, he found a kindred spirit who revived the dormant literary aspect of his personality. However, when push came to shove, he put family before his own happiness. Had he married Carmen, (a) his family would have lost the business of the cash-cow client of theirs, (b) his family may have cut him off. Was he ready to start life with an almost entry-level income, and a wife who had known a luxurious life with her present husband? Call him a nice and warm human being but a calculating one. The writer brings out the effects of “Mei Mard hu” attitude of Hassaram in “ The Mexican Girl Friend” and of Metha(Mike) Uttamchandani in “ Hong Kong Here I Come” quite forcefully. The feelings and unhappiness of the women in their life matters little to both men. Metha’s ego justifies his coldness to the wife he selected with such clinical calculation in the gallery presented to him in the (arranged) marriage market. Will he treat Gita(Rita) differently as he promises himself when he takes his halting steps on the road to financial recovery? Or will it be a forgotten pledge? “Requital,” apart from the refreshing atmosphere of the North East, reminded me of Sindhi young men, who steal the customers and sources of supply of their bosses – they bite the hands that gave them a start in life. “The Bhorwani Marriage” captures the comic drama, rather the mini dramas, enacted when a marriage is being arranged. The best story in the collection is “Water on a Hot Plate.” The narrative flows with events, meaningful conversations, memories. The issues touched up are the classic dilemmas of expatriates. In this case an element of poignancy is added by the fact that the chief concern of the older characters is about the loss of their unique culture with its blend of Hindu, Islamic and Sikh traditions. “Gift for the Goddess.” When modern engineering and superstition collide in rural areas, who wins? You guessed it: superstition. What I wonder is that when men think of evil, why do they attribute it to a goddess/ a ma? “Sunday with Mary” is typical of middle class life and yet it is atypical. How many couples take that trouble to ferret out that little space in a hard existence for each other and organize the day and week around it? Six days of spoken and unspoken bickering? These are the marriages that survive all the odds and there plenty of them around. “Teesta Holiday” was chilling. A life changing experience, I would imagine, for all four. The question is, or the better or worse? Will they never venture into the hills again? Or will they learn to appreciate life better after coming face to face with death? In “Shiva’s Winds,” we are not shown people coming face to face with death. The story is about those who challenge the elements. We are told about the reasons why the seasonal laborers trek to higher altitudes, the vagaries of weather, and the final surprise about the baby who conquers the elements while the adults don’t. “The Inner Light” reflects the reality of religion exploiting the gullible. What is different about the story is that the young kid has been brainwashed into the role practically from birth! I am quite horrified by all the reality shows featuring children; their parents put them through such terrible wringers for those 15 minutes of fame in the idiot box. “The Guerilla’s Daughter,” “Sunday on a Green Lawn” and “The Seasons of Contentment” are love stories on the surface, but their unstated undercurrent reflects our innate refusal to accept each other and shows our biases towards background, economic status, caste, region, or religion. Why do we insist on creating and drawing lines instead of dissolving them? We have a hoary history of merging and mingling. “The Village with Gandhi’s Statue” is also about our propensity to draw inimical lines. Who decreed that death by fire was the punishment for stealing two brass tumblers? I love the irreverent in “Waiting for Leander Paes, Sania Mirza or Somdev Dev-Varman.” It speaks up, while examining the players’ personalities via their playing styles, and mastering it’s master! “Eight Rupees” reminded me of my own experience with a shoe shine boy years ago. Wonder where he is now? He belonged to group of enterprising young with the capacity and drive to go places. “The Shrine” is yet another take on sati, after Padmavati, this time for a lover where the husband failed to ignite. Let me confess. As a post-Partition Sindhi, these stories evoked so much delightful nostalgia for a long gone past, those memories of eavesdropping on conversations of homecoming uncles and cousins, accidental overheard chatter, tales of wheeling dealing, adjusting to different environments, the second families abroad, the celebrations, the songs, looking, listening, absorbing, until one day one realized – so this is what being Sindhi is all about! I’m sure that the various layers of the stories will appeal to different sensibilities, which means to a lot of readers. 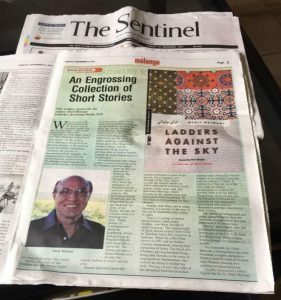 Ladders Against The Sky is a collection of 23 short stories, centering around Hindu Sindhis, a community that lost its homeland when India was partitioned in 1947. The Hindu Sindhis now exist as a diaspora. The author says the contradiction of outward conformity to the mores of societies they live in and the longing for their lost culture has baffled observers. He has tried to show they have lives as individuals too by breaking the stereotypes. The book reminds of the novel Mulligatawny Soup by Manorama Mathai, based on the Anglo-Indian community that comes to grip with the new reality after the British withdraw from India. This collection of short stories, similarly gives a peep into the psyche of the Sindhi community. It comes as a revelation that the community flourishes in places such as Hong Kong, Taiwan and South America. Their acumen for business is well documented, not surprising since the author himself kept changing careers — from working in his father’s textile store to being a distributor for Coca Cola in Meghalaya, from running a book store to teaching English literature in a college, before finally taking the plunge to head an export company in Taiwan. The author’s rich knowledge of the export business is revealed in the story, The Head of a Chicken, in which an immigrant into Hong Kong struggles his way to reach the top. Though the author tries to show how he buries all scruples to do so, along the journey, one learns what it takes to get going in the export business. Hong Kong, Here I Come offers an insight into customs and tradition of these countries. The Bar Girl has a beautiful theme in which a divorced businessman gets close to a bar girl but realizes the disruptions it will cause in their lives. He finances the girl’s education as a nurse to help her get out of the profession, and then goes out of her life. But not without the girl telling him that she has married but does not love her husband because she actually loved him. A similar theme crops up in the story, Writing a Fairy Tale, in which the man falls in love with the wife of a client, realizes the upheaval it would cause in their lives, and finally places family before personal happiness. However, the one story that leaves one slightly perplexed is The Mexican Girlfriend. Despite being egocentric and a dominant patriarch, the need for Hassaram to shoot his son’s Mexican girlfriend, is baffling. The father is against his son marrying Linette, a descendant of the Conquistadores, and talks him out of his reverie. Not reconciled to this, the son elopes with Linette after marrying an Indian girl as per his father’s wishes, feigning kidnapping. An enraged father shoots the girl and flees to India. The first section of the short stories, Abroad, is quite readable. It deals with the community’s toil on foreign shores, their adaptability, success and a desire to retain their oneness. The second section, In Transit, is a portrayal of cultural practices like in The Bhorwani Marriage. The third section, At Home, has stories that are varied — Teesta Holidays about nature’s fury, Shiva’s Winds about a miracle in which an infant survives icy winds near Rohtang Pass and The Inner Light is about how Buddha gets the gift of prescience. The book has a foreword by actor Victor Banerjee, the choice reflecting the yearning of the diaspora as Banerjee acted in the David Lean’s film, A Passage To India, based on EM Forster’s book. The cover of the book has the Sindhi Ajrak patterns, suggesting the diversity of stories. The author uses “pranams” and “dhanyawads” to thank his collaborators, balancing tradition and modernity, symbolizing the cleft the community finds itself caught in. I have just finished reading Ladders against the Sky. A short story collection form the chronicler and critic of the genre after the lapse of decades. May more volumes follow from his that don’t compromise the sentinel’s guard! The Overseas Stories are longer, urbane and sophisticated. The activities of Sindhi businessmen are portrayed with empathy and truthfulness. These hard-headed men are moved by the sincerity of a bar girl, a customer’s wife and a Mexican girl and respond magnanimously. The writer has a story to tell and he tells it in clear language with a thorough analysis of the background. No wonder Somerset Maugham comes to mind. The Indian Stories are shorter, rural oriented and exotic. How a shrine originates, how a swami crops up and how a stranger is treated are narrated with graphic detail. Two couples escape from Nature’s wrath in one story whereas a family is martyred on the same altar in another. The stories present contrasting aspects of Nature. “The Bhorwani Marriage” adds humor to the fare. No wonder Mulk Raj Anand comes to mind. U. Subramaniam is the author of the following collection of short stories: Vimala is Willing and Other Stories, The Committed Official, When the Pandavas Won, The Evening of Life, As Dusk Falls, Selected Stories. When we look at the Brahmaputra river we see not only its beautiful surface but also become aware of the undercurrent. This is the comparison my mind made when I read Murli Melwani’ s collection of short stories. On the surface Murli Melwani’ s stories hold our attention because of the series of events, the strokes delineating character, the touches of description and the dialogue. The undercurrent is formed by the social concerns, political issues, the contrast of traditions and the ethos of the setting, all of which are suggested rather than stated. Stories like “Gift for the Goddess” and “The Divine Light,” set in Rajasthan, bring out the clash between traditional thinking and the scientific temper of the space age. “Shiva’s Winds” and “Teesta Holiday,” embedded in the rugged beauty of the Rothang Pass and the North Bengal Hills respectively, pit the forces of nature against the indomitable human spirit. “The Village with Gandhi’s Statue,” with the background of the tobacco growing areas of Andhra Pradesh, exposes the moral heartlessness of the influential. Khasi Hills is an apt backdrop for some of the stories. “Sunday on a Green Lawn” is a touching love story. “Those Season of Contentment,” is about the growing up and the heartbreak of loss. “Requital” records how irony plays out in life. “The Shrine” presents a Khasi folktale as a re-mix (the current fashion in music and the arts). expatriates fly into India to find partners for their children. “Sunday with Mary,” set in urban Mumbai, is a picture of the sort of life led by expatriates who return to India. There is a group of stories about Indians, particularly Sindhis, who have decided to settle overseas. The backgrounds of these stories extend from Chile to Thailand and a few countries in between. “Water on a Hot Plate” shows an NRI and an Indian-Chinese restaurateur sharing their memories of India. “The Head of a Chicken,” moving between Hong Kong and Taiwan, is the story of an unscrupulous businessman who will do anything to further his ends. “Writing a Fairy Tale” tells of the attraction between and an Indian exporter and a beautiful women trapped in an unhappy marriage with the exporter’s client. A hostess in a Thai bar, in “A Bar Girl”, helps an elderly businessman to restore his severed links with his family. “Hong Kong, Here I Come” and “The Mexican Girlfriend” are portraits of two insensitive individuals who destroy themselves and their families by their actions. The variety of backgrounds and strong characterization form the two banks through which this mini brahmaputra of stories runs. Most of these stories were first published in journals and anthologies in the U.S., U.K., India and Hong Kong. Some of them were nominated for a number of awards. The Foreword, by Victor Banerjee, a distinguished son of the North East, is highly perceptive. Mention must be made of designer Aditi Phukan’s unusual, eye-catching and pleasing layout. I highly recommend Ladders Against the Sky by Murli Melwani. “The Head of a Chicken,” a story that moves between Hong Kong and Taiwan, is the study of an expatriate who buries all scruples to reach the top; his employer, friends, family are mere adjuncts to his ruthless ambition. “Writing a Fairy Tale,” set in Miami and Chile, is about a young businessman, Jimmy Ramani, with literary aspirations, and Carmen, the wife of a client of his. They decide to collaborate on writing a story; the story becomes a metaphor of two beautiful lives wasted in a wrong marriage and a wrongly chosen profession. Stories like “Gift for the Goddess” and “The Divine Light,” set in Rajasthan, record horrifying occurrences that do not belong to the 21st century. “The Village with Gandhi’s Statue,” placed in Andhra Pradesh, exposes the moral callousness of the rich. In “The Guerilla’s Daughter,” with the background of the early years of the insurgency in Nagaland, tell the romance between a Naga girl and an Indian Army officer. “Those Seasons of Contentment”, is about the heartbreak of loss and growing up. In “Shiva’s Winds” and “Teesta Holiday,” set against the Rohtang Pass and the North Bengal Hills respectively, the indomitable human spirit clashes with the forces of nature. There are also the gems that fall outside the two categories but that bring a smile to the face – from the irreverent “Waiting for Leander Paes, Sania Mirza or Somdev Varman” through “Sunday with Mary” to the “Bhorwani Marriage,” which relates the mini dramas that take place when a marriage is being arranged. The themes that Murli Melwani has chosen are relevant and contemporary. The stories that highlight the social contradictions in modern Indian life make us wonder why a country that can put satellites in space cannot shake off the burdens of outmoded thinking. The stories about the Sindhis bring out the contradiction between the outward conformity to the mores of the overseas societies where Sindhis live and their longing for their vanishing culture and language. The stories also contrast the attitude of the older generation with that of the younger one – the former cling to the past while Generation X wishes to embrace the modern world. Like most collections of short stories, the stories have strengths and weaknesses. The choice of themes and the use of humour, satire, straightforward narration, characterization and locales to convey the writer’s vision are obvious strengths of the collection. However, the author tends to go into minute details of the background, a laFrederick Forsyth, whether of a locale or a happening, and this weakens the stories at times. For example, some of the stories talk about how the 2008 economic collapse affected Hong Kong, the effect immigration regulations have on persons, the enmity between tobacco growers in Andhra Pradesh, as in “The Village with Gandhi’s Statute” and the life of migrant labourers in “Shiva’s Winds.” It’s not that the details are not interesting, but that the stories could do without too much of them. I also found that the author’s treatment of the downtrodden compared with that of the influential lacks balance. But let me confess. As a post-Partition Sindhi, for me these stories evoked so much delightful nostalgia for a long gone past – the memories of eavesdropping on conversations of homecoming uncles and cousins, accidental overheard chatter, tales of wheeling dealing, adjusting to different environments, the second families abroad, the celebrations, the songs, looking, listening, absorbing – that I suddenly realized that this is what being Sindhi is all about!